Escape to this unbelievably unique vacation estate that feels like your own private resort. 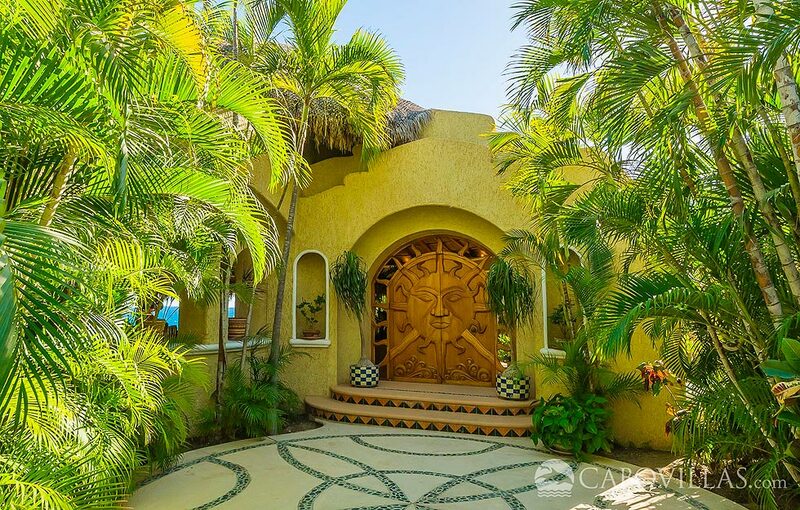 An ornately carved wooden entryway welcomes you on arrival at Villa Las Rocas as the soothing sounds of the surf carry on the breeze rustling through palm trees. Masterfully carved by skilled artisans, the massive wooden door boasts a sunburst, its face gazing blissfully above the ocean as an inviting symbol for all who spend time at this private oceanfront retreat. Upon entering, you feel yourself begin to relax as you admire the awe-inspiring beauty of the décor and surrounding natural landscape. You’ve arrived to paradise, and this extraordinary estate promises a truly unforgettable setting for family and friends to enjoy. 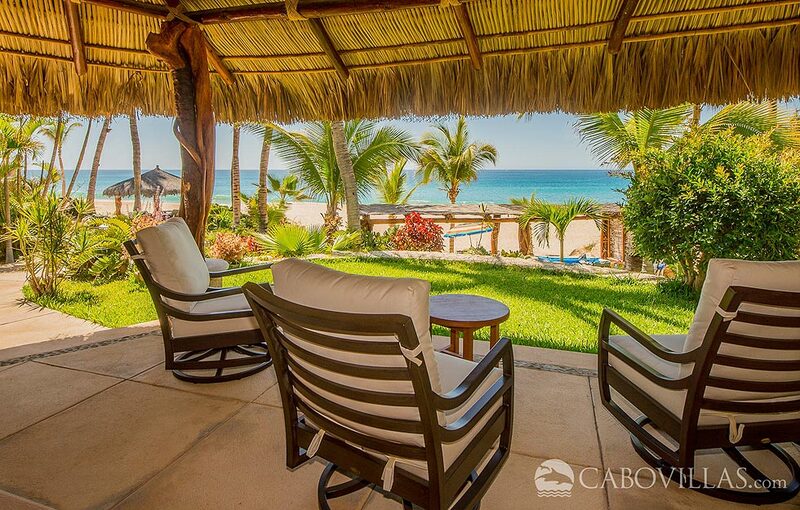 Having been extensively remodeled and updated, this breathtaking vacation property is like no other in Los Cabos. 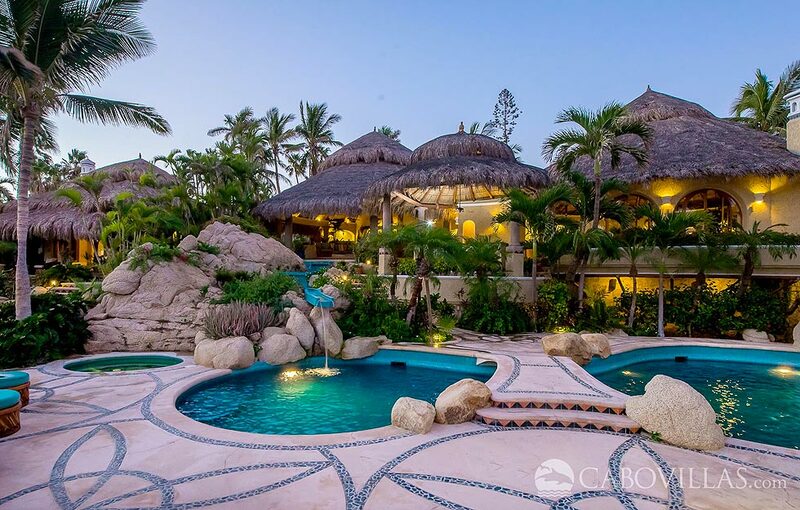 Commanding a beachfront location on 1.6 acres, Villa Las Rocas cascades down a gently sloping natural rock formation– hence its name. Tiered along the landscape with spacious common areas overlooking the sea, each terrace offers a private patio with large shade areas perfect for entertaining or lounging. 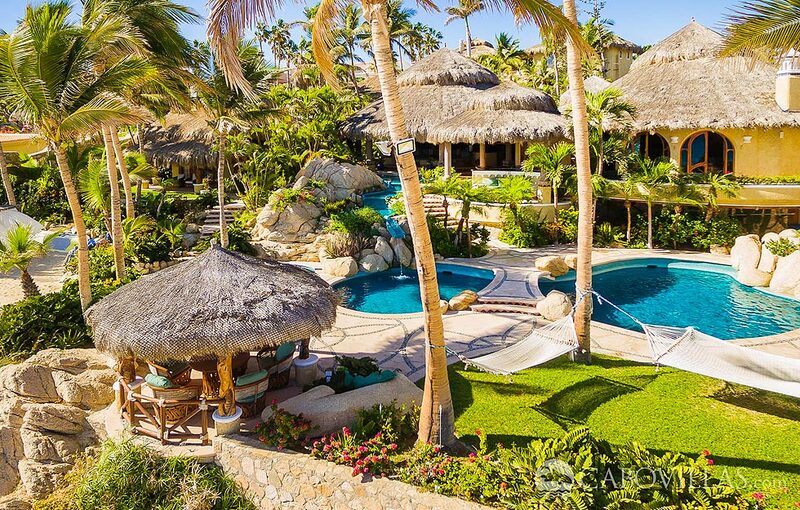 Designed by renowned architect Marco Aldaco, the villa is a masterpiece of authentic Manzanillo construction and coastal style. Aldaco has been celebrated as one of Mexico’s premier architects by the world’s most influential authorities. A focal point of Aldaco’s style is the interplay of interior and exterior spaces which flow seamlessly into one another. Designed to encourage gentle breezes and natural sunlight, the villa offers a perfect mix of traditional charm and modern comfort. The décor has been carefully chosen to showcase classic Mexican artistry including handmade furnishings, genuine tile and colorful folk art. The centerpiece of the outdoor living areas is the stunning, multi-level 30,000 gallon swimming pool, complete with a waterfall and a footbridge. The lower pool is nearly at the same elevation as the beach, with the sand literally steps away. 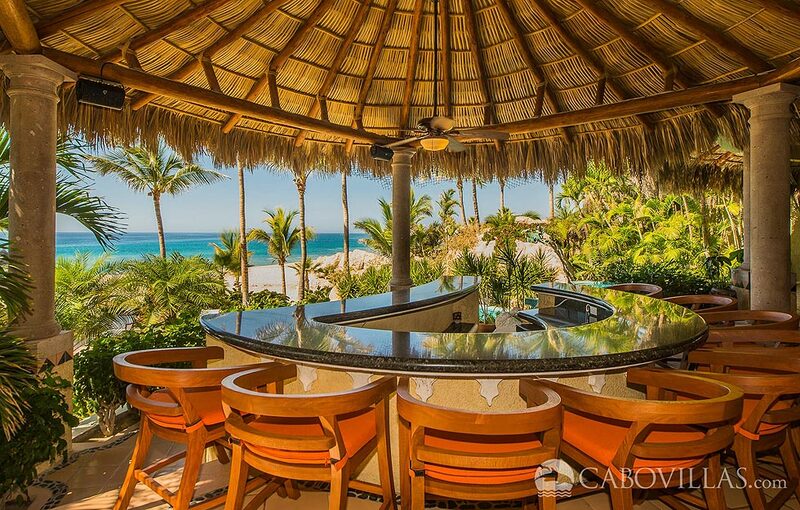 Guests can relax poolside or in the sparkling waters while admiring tranquil Sea of Cortez views or even whales as they make their way along the coastline. 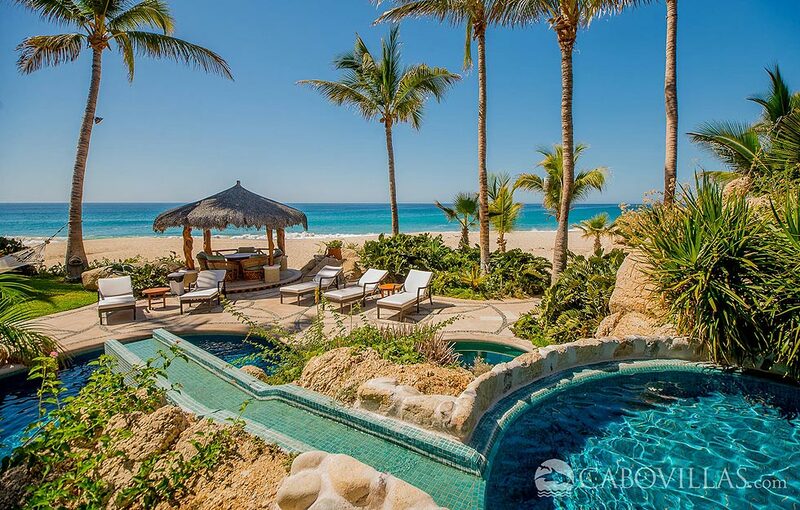 The villa is well-equipped to take full advantage of its unique beachfront location, with pool toys, beach chairs, umbrellas, kayaks and standup paddle boards available for guest use. Adding to the resort-like ambiance, guest accommodations are housed in a series of individual casitas offering unique amenities. Ideal for families and groups, the villa’s special layout affords guests the comfort and privacy of their own independent sanctuaries combined with the convenience of large common areas to enjoy socializing. Air-conditioned suites feature private bathrooms and a range of bedding options. The sensational 1,600-square-foot ocean-view master suite boasts a wet bar, jetted tub and its own living area. Luxuriant landscaped garden paths meander throughout the property, beautifully complementing the villa’s living spaces. Whether you’re commemorating a special milestone with loved ones or simply enjoying a relaxing escape, a variety of extra services are available to make your experience personalized and stress-free. Private chef services, event catering, entertainment, convenient grocery pre-stocking and in-villa spa treatments can all be easily arranged prior to your trip. 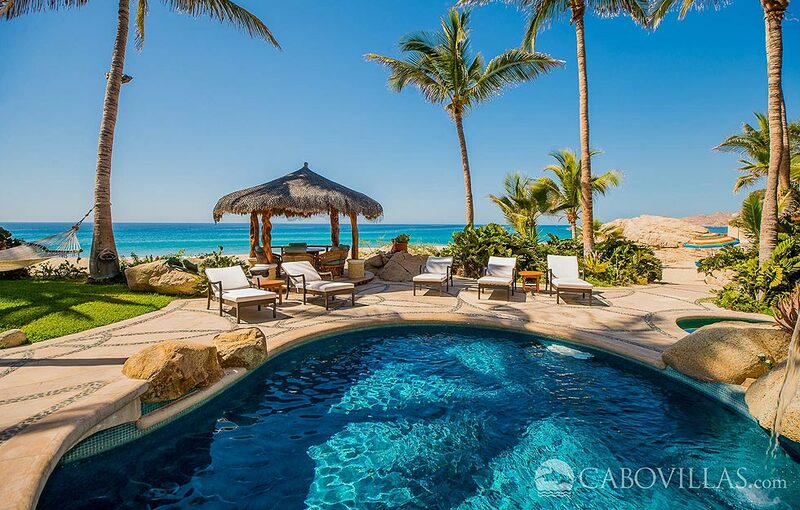 Although you may find yourself blissfully reluctant to leave this dreamy oasis, the property is ideally situated to enjoy the many recreational opportunities available in Los Cabos. 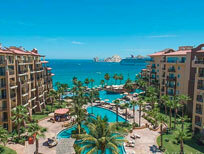 World class golf courses are just a short drive away, including Cabo Real and Cabo del Sol. 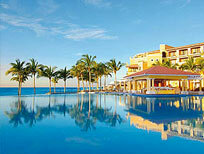 Additionally, two new luxury resorts are walking distance from the villa. 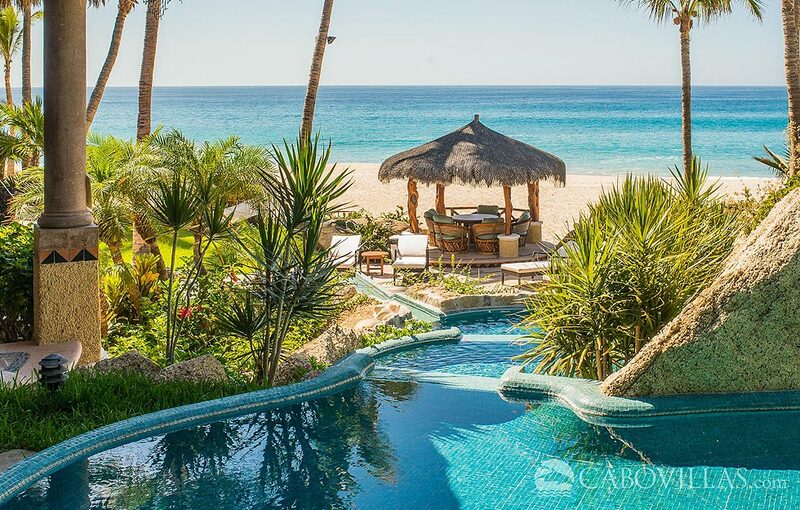 Both the Grand Velas Los Cabos and Garza Blanca Resorts are perfect for accommodating additional guests for events or destination weddings, as well as offering gourmet dining options. 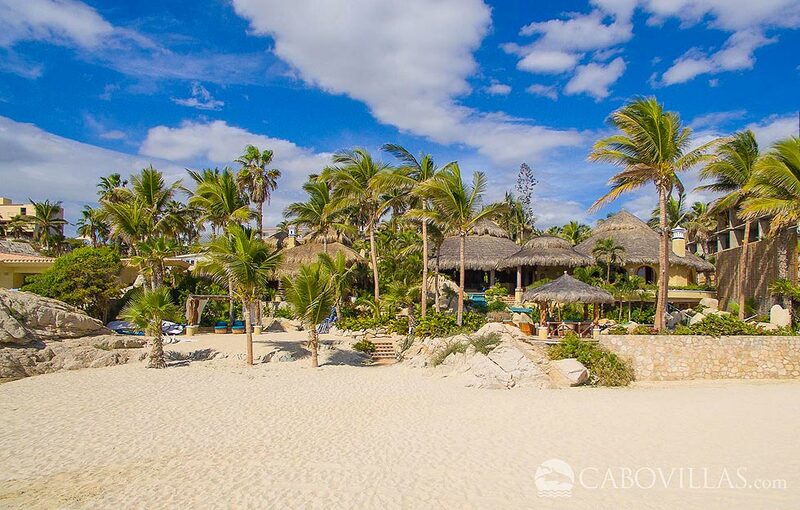 When you’re ready to explore, Cabo San Lucas and San José del Cabo are easily accessible from the central Corridor location of Villa Las Rocas. The villa’s owner says, “once you enter the front door of the Villa Las Rocas and gaze out to the Sea of Cortez, you’ll know, you’re there – the happy place!” Happiness is truly awaiting guests at this remarkable retreat, where the aquamarine hues of the Sea of Cortez serve as the backdrop for an authentic beachfront vacation getaway – pure bliss! 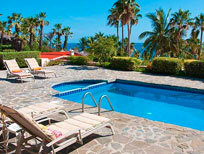 Contact our team to start planning your next getaway at Villa Las Rocas today. 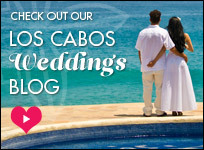 This entry was posted in Cabo Villas and tagged Cabo, Cabo San Lucas, Cabo Travel, Los Cabos, Villa las Rocas, Villas. Bookmark the permalink.